Reproductive Advocacy Health Education (RAHE) Ghana a Non-Governmental Organization has proposed for an introduction of reusable pads for adolescents girls to, as part of moves improve girl child education. Speaking at a day training workshop for teachers and headteachers in the Awutu Senya East Municipality in the Central Region, Programs Coordinator for RAHE, Mr Paul Teiko Tagoe, mentioned that, over the period one major causal factor of absenteeism of girls in rural communities from school has been menstruation. This has negatively contributed to the development of girl child education. It's severity, he said generally have economic impact on their lives and on the country. According to him, the phenomenon largely is due to lack of financial capacity to afford sanitary pads during this period. The world bank estimates that, about 500 million women and girls globally lack adequate facilities for menstrual hygiene management. And this is as a result of inadequate Water, Sanitation and Hygiene (WASH) facilities, particularly in public places, such as in schools, workplaces or health centers. In some rural communities in Ghana, girl school absenteeism is rampant; and is due to lack of proper menstrual hygiene management. The project he added seeks to address the barriers. Mr. Tagoe opined that a convenient reusable pad is a sure way to minimally curb the situation. He believes that it will keep the girl child in school during menstrual period. 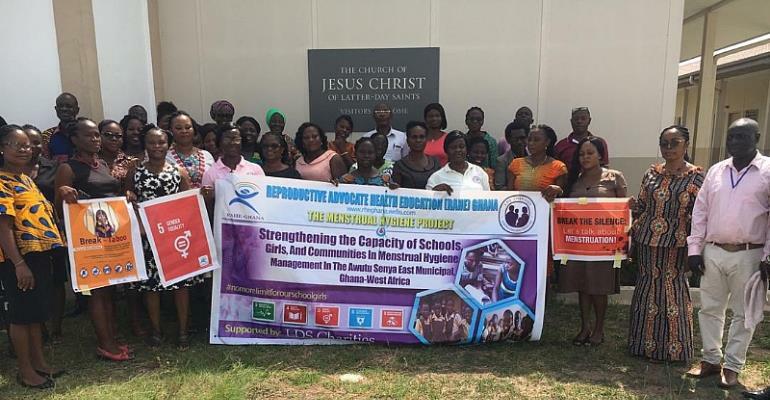 The training with support from Latter Day Saint Charity (LDC), he said is a one year period that seeks to train 1000 students from 10 schools in proper and sustainable menstrual hygiene management each with a representation of 100 girls. As part of the project, an extension of community-inclusive based advocacy approach will be inculcated to address menstrual hygiene from all angles. Periodically, training and capacity building of teachers and community leaders, he added will be organized. He urges philanthropists, donor partners and individuals to support the project and keep the girl child in school.